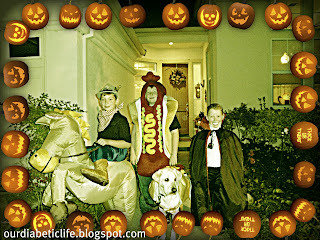 Our Diabetic Life: Halloween and some tough love. Halloween and some tough love. It was the best Halloween ever! It was the best Halloween FOR ME ever! We skipped the school Harvest Party. We skipped the church Trunk or Treat. Instead, my husband took the older boys to Six Flags Fright Fest, and I took the younger boys out to dinner and then home to make pumpkin muffins. Then Halloween we trick or treated and that was the end of it. SO NICE! Admittedly a little selfish on my part, but it was so dreamy I can’t even bring myself to feel guilty. I think I mentioned last week that I was planning to have the boys sell me their candy this year for gifts. I did put that plan into action with mixed results. L JUMPED at the chance to give away his candy for the Baukugan. J was very much into the iTunes gift card. He negotiated for 20 pieces of candy and then happily handed the rest over. But B. My dear boy B, didn’t want anything to do with it. He wanted his candy, and there was nothing he was willing to trade for it. Talk about my plan backfiring. So I had to pull out the tough love. It eventually came down to me telling him he was only going to be able to keep (J's negotiation of) 20 pieces…"So here are the gifts, now pick out your favorites and hand me over the bag. " B had some tears as he handed it over, but weirdly enough less than 2 minutes later he was laughing and happy as all get out. He was opening his Pokémon cards and had a huge smile. He gave me a kiss and a hug and it was like all the tough love I handed out didn’t happen. Another reason Halloween rocked for me? L wore a costume that M, J and B had worn in the past. B wore a costume that M and J had worn in the past. J and Lawton were the only two I bought for. They wore matching Hot Dog costumes. I know I sound like a lazy mom right now…but when you are caught up in the October blahs…which haunt me EVERY YEAR…simplifying seems to make everything better. My sister in law thinks this Halloween was amazing for me because I finally decorated for the holiday, which pushed me to get into the spirit of things. But I know better. I wasn’t overwhelmed. I wasn’t running around like a chicken with my head cut off…I was able to just enjoy. Which every mom knows…is a blessing for sure. Hip Hip Hooray that it was your best Halloween in years Meri. Sounds Fantabulous! AND the boys and Lawton are decked out...to the max. Looks like a fun time was had by all. I'm glad that you got to enjoy Halloween this year!! Sweet & Simple. That was my theme this year too.... and it worked!!!! I am so doing the trading candy for gifts thing next year. We litterally have a candy infestation going at our house right now. Not good! Sounds like a fabulous Halloween Meri! And a little tough love once in a while ain't all that bad! Yay for keeping it simple! Yay for you Meri! I get stressed with one D kiddo and school parties if I can't be there...I can only imagine what you go through...I can picture the chicken with your head cut off:) October blahs here too. I'm not ready for the cold! 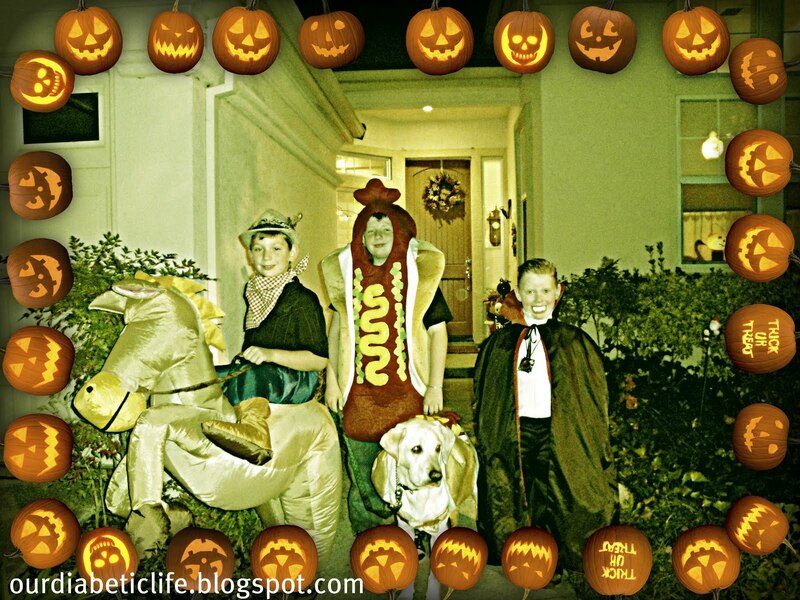 Oh my do I love the hot dog costume..that is so funny! Sounds like a wonderful Halloween Meri. Those tough love moments are hard but kids bounce back quicker than we think. Still sounds b-u-s-y to me! I tend to go underboard rather than overboard, and sadly, my kids no this. Set the bar low and it's easy to get over ..... that's my motto! Hehe. Your plan is better that my plan which is to eat all the candy myself. I might come out on the "larger" end of that deal. I'm glad you had a great Halloween... for you. Can we put this on the JDRF blog? I'm with ya on the simple for Halloween. This was our first Halloween with the D and though it went just fine...I skipped all sorts of activities that we would have normally scrambled to attend. AND WE LIVED TO TELL ABOUT IT! HAHAHAHA! sounds like a rocking halloween to me! Way to go!